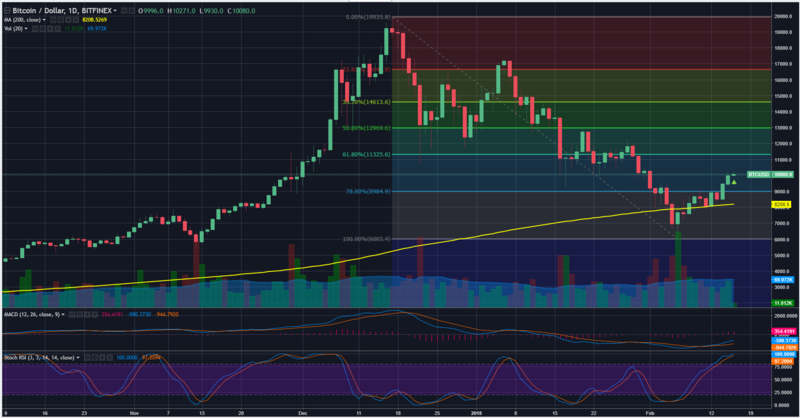 BTC is now back to the bullish mode ! As predicted, after the Chinese New year 2018 (16th February 2018), the bull is back. The 1 D closing candle has been floating above the 200 days Moving Average (Yellow line), hence it is showing good sign. The Purple line is the trend line from the lowest point in February 2018 back to the September 2017. Regression channel also showing the candle is closing above the red region after 12th February 2018, moving up towards breaching the blue ribbon. MACD blue lines also showing a good sign of bullish movement (Golden Crossover) since 11th February 2018. Stochastic RSI shows overbought which shows that the appetite of the market is back on bullish mode. Therefore it is the right time to buy or enter BTC with some rational positioning (amount of money to invest).